Home / Posts Tagged "Ted Nissly"
On October 1, 2018, the Federal Circuit issued an opinion regarding the removal of a priority claim in an application, of a chain of applications, and its detrimental effect on the priority claims of pending and subsequently filed applications in the chain. In Natural Alternatives International v. Andrei Iancu, No. 2017-1962 (Fed. Cir. Oct. 1, 2018), the court affirmed the Patent Trial and Appeal Board’s (“PTAB”) final determination in an inter partes reexamination affirming an examiner’s rejection of the challenged claims of U.S. Patent No. 8,067,381 (“the ’381 patent”) as anticipated by or obvious over cited prior art, including a parent of the ’381 patent, because the ’381 patent could not claim priority to the parent. Natural Alternatives International (NAI) filed a chain of eight U.S. patent applications between 1997 and 2011. NAI filed the first application on August 12, 1997 and included a priority benefit statement under 35 U.S.C. § 120 to the first application in each subsequent patent application of the chain. On April 10, 2003, NAI filed a provisional application while the fourth application in the chain was still pending. On November 18, 2003, NAI filed the fifth application as a continuation-in-part of the fourth application. 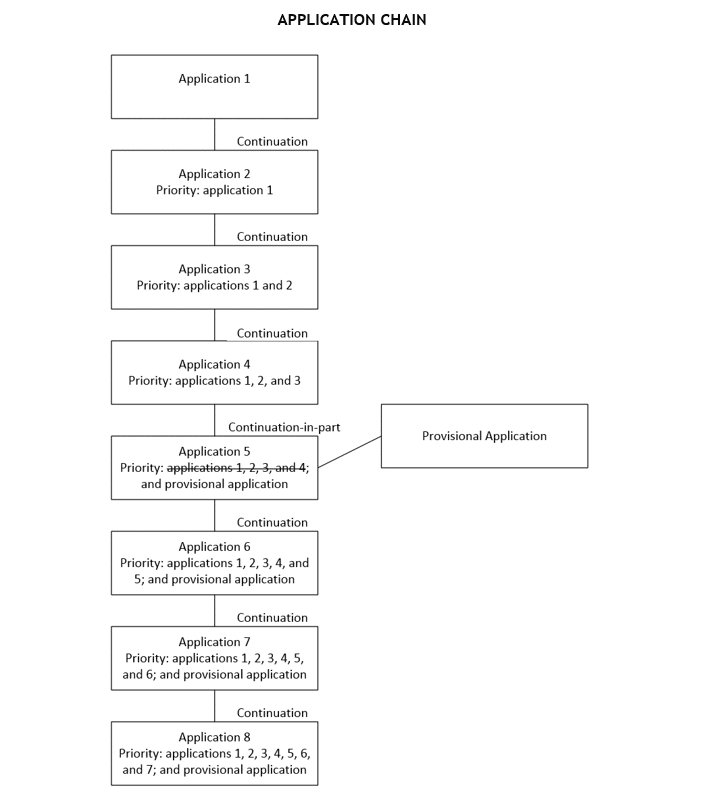 The fifth application claimed priority to the first through fourth applications and the provisional application. On August 29, 2008, NAI filed a sixth application that claimed priority to the first through fifth applications and the provisional application. The court noted that at the time NAI filed the sixth application, the fifth application and the sixth application correctly claimed priority to the August 12, 1997 filing date of the first application. On September 2, 2008, four days after filing the sixth application, NAI amended the benefit claim of the fifth application to claim priority under 35 U.S.C. § 119(e) to only the provisional application as an attempt to extend the potential patent term of the fifth application. NAI subsequently filed the seventh and eighth patent applications that claimed priority to the first through fifth applications and the provisional application. The eighth patent application issued as the ’381 patent on November 29, 2011. NAI appealed the examiner’s decision to the PTAB, which affirmed the examiner’s rejection. The PTAB determined that because NAI deleted the claim of priority to the fourth application in the fifth application and the eighth application claimed priority to the first application via the fifth application, the eighth application was not entitled to the priority claims of the fourth through first applications. NAI appealed the PTAB’s priority determination to the Federal Circuit. On appeal, NAI asserted four arguments: (1) that priority to the first application “vested” with the sixth application once the sixth application satisfied the criteria of 35 U.S.C. § 120; (2) waiver of priority in an application is limited to the instant application (i.e. that application with the amended priority claim) and does not extend to subsequent applications; (3) priority is not a single growing chain, but rather multiple fixed chains; and (4) the PTAB’s view on priority limits an applicant’s ability to amend a priority claim to gain patent term. Regarding NAI’s fourth argument, the court noted a natural trade-off exists between priority and patent term. The court explained that an “uncommon but permissible way for patent applicants to avoid losing term [for a patent application] . . . is to disclaim the benefit of earlier filing dates” which in turn makes the patent application’s “children become vulnerable to rejections based on a larger pool of prior art—including former parent applications in some cases.” The court therefore rejected NAI’s attempt to gain patent term for the fifth application while maintaining the priority claims of its children. Accordingly, the court affirmed the PTAB’s final decision invalidating the challenged claims of the ’381 patent. This case highlights some potential pitfalls to consider when deciding whether to amend a patent application’s priority claim. A practitioner may understand the limiting effect the amendment has on the priority of the amended patent application, but she must also keep in mind that the amendment may irreversibly limit the priority of any child application of the amended patent application too. To ensure that a priority claim is not lost, the practitioner should consider maintaining the priority claim in currently pending applications, especially applications with pending child applications, and filing a new continuation and/or continuation-in-part with a different priority claim. In this way, the claim of priority can be protected for the chain of currently pending patent applications and a longer patent term can be pursued for the new application.